Golda Meir (1898 nî 5 goe̍h 3 ji̍t – 1978 nî 12 goe̍h 8 ji̍t), chhut-sì hō Goldie Mabovitch, sī Í-sek-lia̍t ê chèng-tī-chiá, i sī kok-ka ê kiàn-kok-chiá chi it, mā sī in tùi 1969 nî kàu 1974 nî kan ê tē-4 jīm siú-siòng. Kathleen Kuiper, pian. (2010). 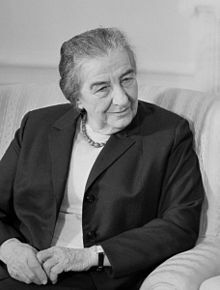 "Golda Meir". Britannica Guide to the World's Most Influential People: 100 Most Influential Women of All Time. Encyclopaedia Britannica, Inc. ISBN 978-1-61530-058-7. Chit ia̍h siāng bóe tī 2017-nî 6-goe̍h 17-ji̍t (Pài-la̍k), 06:30 ū pian-chi̍p--koè.